Nitzan Haroz, a native of Israel, rejoins The Philadelphia Orchestra as Principal Trombone in 2014 after holding the same position with the Los Angeles Philharmonic since 2012. Previously he was Principal Trombone of The Philadelphia Orchestra since 1995 after serving as Assistant Principal Trombone of the New York Philharmonic and as Principal Trombone of the Israel Symphony and Opera Orchestra. He was also first trombone of the Israel Defense Forces Orchestra and performed with the Jerusalem Symphony Orchestra. Haroz has appeared as a soloist with the Philadelphia Orchestra (which included his Carnegie Hall solo debut, where he world-premiered Blue Winter for trombone and orchestra by Roland Pöntinen), the Israel Philharmonic Orchestra, Israel Symphony Orchestra, the Jerusalem Symphony, Sofia Radio Symphony, and the Fairbanks Symphony, among others, and is an active recitalist and chamber musician. He is a first prize winner of the François ShapiraCompetition in Israel and a former scholarship recipient of the America-Israel Cultural Foundation. He has commissioned and premiered several works for trombone and harp with his mother, harpist Adina Haroz. 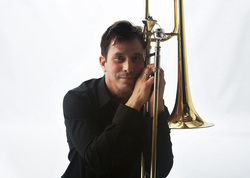 Harozis a frequent clinician at trombone conferences world-wide and has given master classes and recitals in Israel, the U.S., Europe, and Asia. Haroz has performed with the New York, Philadelphia, and Israel brass ensembles, the Rishon-Le Zion Brass Quintet, and many other chamber groups. His teachers included Eli Aharoni, Mitchel Ross in Israel, and Joseph Alessi at the Juilliard School. His recording Towards the Light was released in 2004. Haroz serves on the faculty at the Curtis Institute of Music.